Paying Traffic Fines in Spain: This Time We Refuse To Pay! We didn’t now how to do it but I, Lisa, was determined to find away. We are true believers that if you “commit the crime” (and get caught) then you should “do the time”. In a previous post, we confessed to driving legally, although totally unaware, and were thankful that a fine was issued. Had this not happened it could have been a much more expensive lesson! (We’ll add a link at the end of this article). However, when we know that procedures have not been followed and we are being unfairly penalised, we will do our best to fight the matter. We don’t fear authority. We respect authority. However, authorities can make mistakes too. And why should we pay for their mistakes? 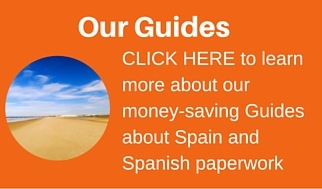 So, why are we once again talking about traffic fines in Spain? Much to my despair, a couple of years ago, he acquired a motorbike. He is a very careful driver, and took his full motorbike course and test, and despite my previous resistance, (he’s been wanting one for over 5 years), I decided he was responsible for his actions and decisions. My only insistence was that the children went nowhere near it! So, the ding dong of the doorbell marks the arrival of the dreaded recorded delivery envelope from an official department. They don’t send good news like this. You just know that receiving these envelopes are going to cost you money. HOW MUCH????? was our immediate response as we opened the dreaded envelope and saw the figure of NINE HUNDRED EUROS! The last time I had seen a fine like was this was many years ago when I assisted a young lady, with the help of my lawyers, in getting her father released from prison. So, you can imagine my shock! 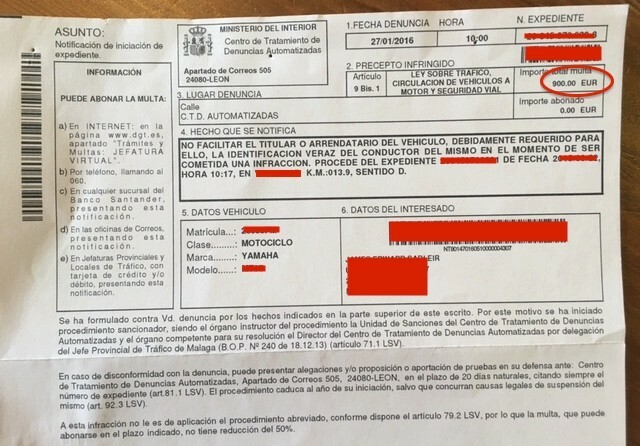 As we’ve previously mentioned (read this post), as is the case with most Spanish paperwork, the way traffic fines are issued and processed are a bit like the lottery. However, certain rules must be followed. The penalty for non-compliance is a very hefty fine. Once a traffic fine is emitted, time is of the essence. Prompt payment is rewarded (if you receive the notification of course!). If you do not reply to the original notification, within the allotted time, the fine multiplies at an incredible speed. And before you know it, your 150€ fine is suddenly €900!!! And if you ignore this, money will be embargoed from your bank accounts, you will be refused credit and life basically gets more complicated in lots of unexpected ways. If you receive a fine, pay it as soon as possible and, in most cases, you will qualify for a 50% discount. If you receive a fine for 900€ as we did, and you are certain you have not received any prior notification, Contact Us and we’ll put you in touch with the lawyers who are contesting our case. Upon receipt of this nasty letter, I initially tried to find more details online about the “supposed offence”. You can check details of any fines you have online (use this link) but it doesn’t really tell you much more that what is written on the denuncia itself. From the letter we received, shown in the image above, we can see the date, time and location of the offence and the number of the original expediente / fine issued. Hubby thought he had been caught breaking the speed limit going up a hill, overtaking a van, and spotting a radar car so we didn’t deny this and were prepared to pay the fine. But, the part of the letter “hecho que se notifica” is accusing us of not having replied to their initial request to identify the driver of the vehicle that committed the offence. That is rubbish! That is why we are going to contest the fine and have lawyers fight our case. Following our conversation, find attached our budget for claiming against the fine. Apparently it is a very common fine, and even if long to claim against it is mostly won. The issue here is that they notified in order to identify the driver at some address which does not correspond to the address where they should have notified. For example, and most commonly, the address where the vehicle was registered with the previous owner. Due to the lack of identification of the driver they issue a second fine, which is the one you received. Which is against the procedure, as they should have attempted to notify the first fine and the request to identify the driver on the second address they hold. Therefore, there are sufficient grounds to claim against this fine. I hope this explanation has been helpful. QUESTION: Have you ever contested a traffic fine? How did you get on? Share your story with our readers!